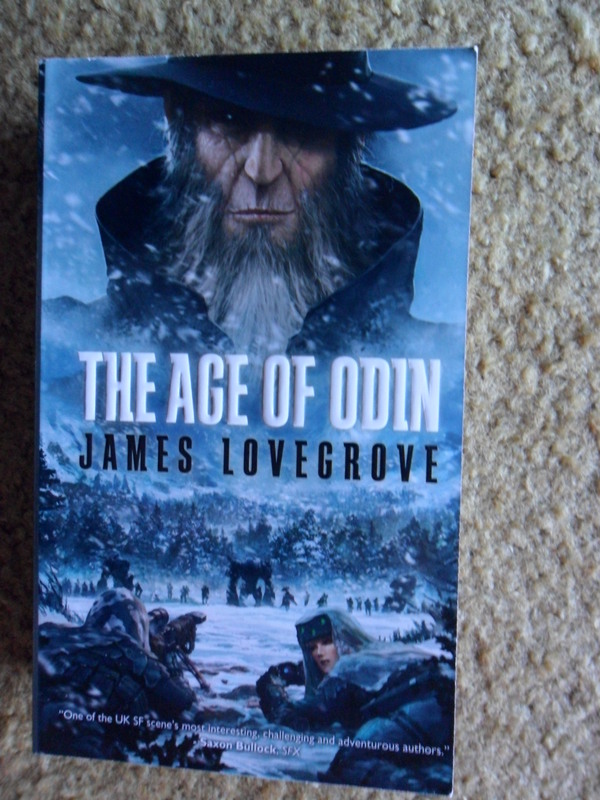 Also recently purchased is The Age of Odin by James Lovegrove. I’ve been on a bit of a Norse Mythology kick lately (watching the beautifully put together board game Yggdrasil being played might be to blame. . . but that’s a whole ‘nother blog post), so I couldn’t resist this book. Has anyone ever read this or any of Lovegrove’s other titles? 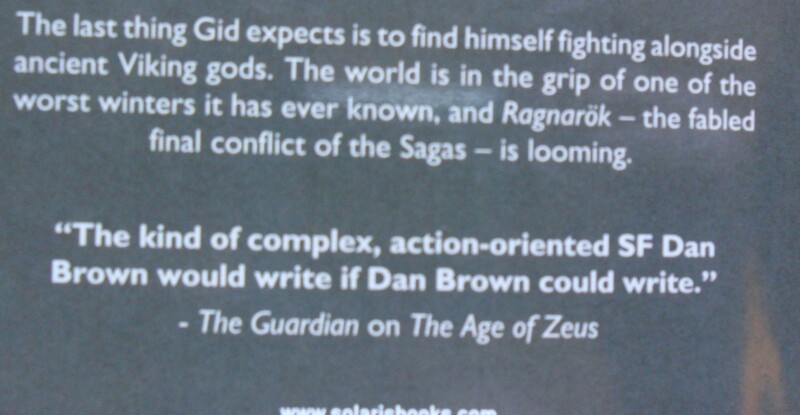 The blurb on the back promoting his The Age of Zeus sealed it’s fate as a book that was coming home with me. It’s funny, but poor Dan Brown! This next goodie I’ve been waiting for for a while, and when I got the e-mail that ARC’s were available, I jumped with joy, squee’d around my office, and immediately responded requesting one. 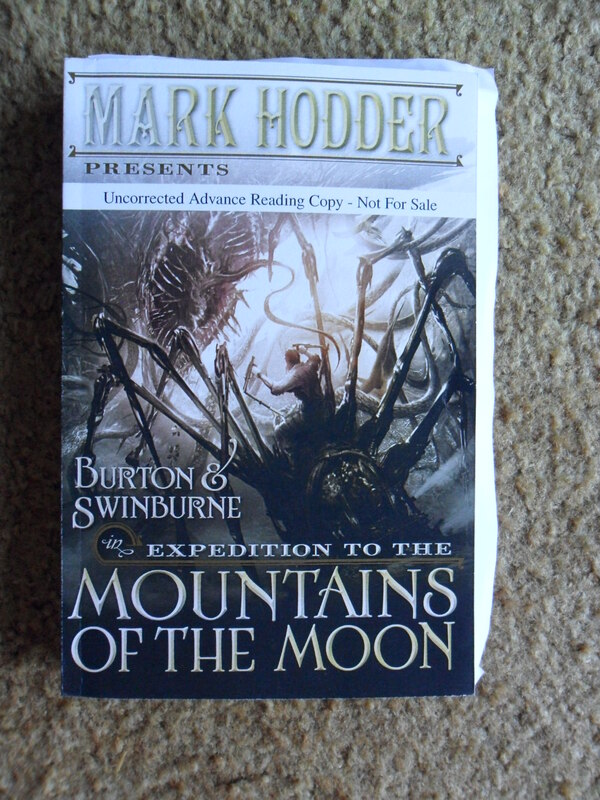 It’s Mark Hodder’s alt history The Expedition to the Mountains of the Moon, the third (and final?) episode of the adventures of Burton and Swinburne. This volume promises the return of one of my favorite time jumping characters, and I wouldn’t mind some more screen (page) time of one of my favorite fellow short redheads with slightly sick senses. . . of humor. Although I may need to make another book cover, perhaps a blue one (I bought the silver embroidery thread just for that!) because that spidery looking thing is already freaking the crap out of me. I don’t care that it’s mechanical or steam powered or whatever, it’s a frakin’ spider! speaking, have you seen that smartphone tv spot where someone’s phone wallpaper is a tarantula, and everyone keeps whacking on the phone to kill it? hilarious! but also f’ing creepy. 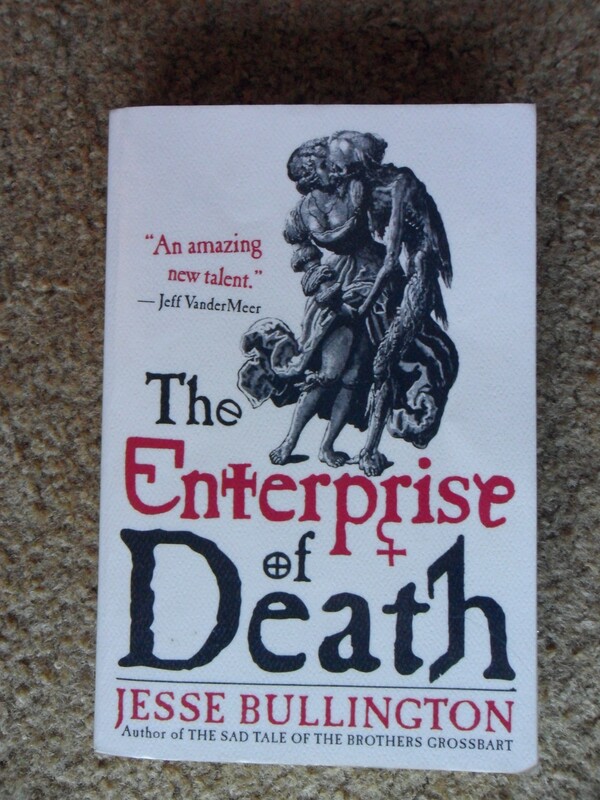 and last but certainly not least is The Enterprise of Death, by Jesse Bullington. This will probably get read fairly soon, because it is a library book, and appears to be another one of those books for people like me who “like that sort of thing“. Also, it’s got the words alchemy, necromancer and Renaissance Europe on the back. Anyone read it? is it good? dark? gritty? gross? Vandermeer blurbed it, so it’s got to be good, right? So there you have it, the latest book things that entered my apartment. And yes, for those of you who are keeping track, I DID trade some books in at the used book store. when you have this many books crammed into this little square footage, books in requires books out. 9 Responses to "a laugh at Dan Brown’s expense"
Haha. Poor Dan Brown. And spiders… why does it always have to be spiders?! Enjoy your reads! Glad you are giving Reynolds another try. 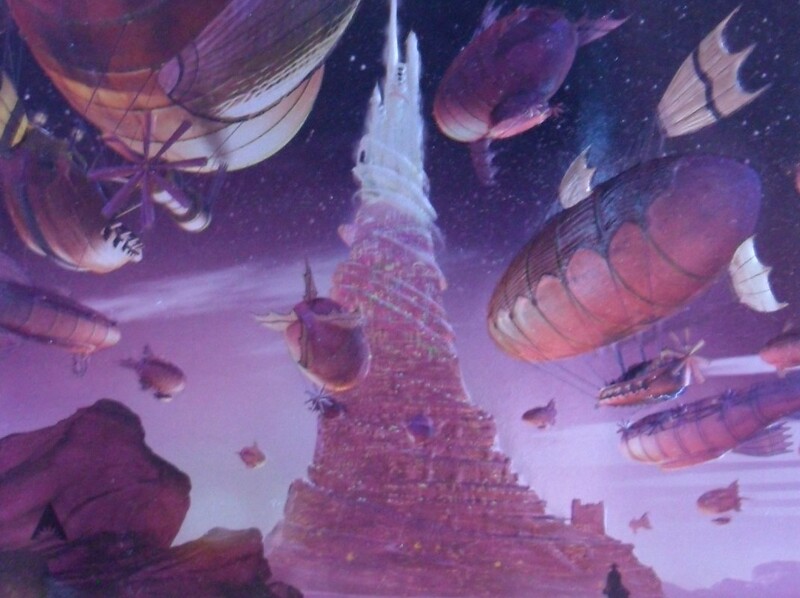 I’ve only read his book Chasm City, which is a stand alone set in the Revelation Space universe, but I was wowed by it and on that book alone I consider myself a fan. I’ve been reluctant to start Revelation Space as I’ve heard it is a rough beginning. I have also read very glowing reviews of the other two books in the trilogy. It looks like we might be reading his book Pushing Ice in the book club next year and I’m looking forward to that. I feel the same way about Brown. He writes non-challenging stuff that’s made him a boat-load of money. good for him. Carl – Revelation Space was a little iffy at first, but I’m happy I read it. I should finish Terminal World in the next day or two (it’s great, by the way), and I’ve heard great things about Chasm City. I’m really happy i have Reynolds another chance! Dude can write! I somehow don’t think Dan Brown actually minds… I mean, it’s free publicity, right? 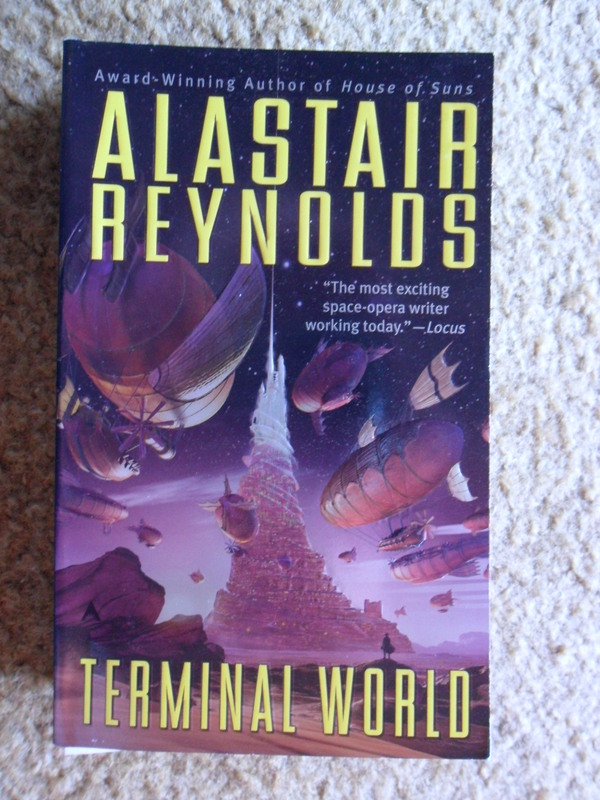 And the cover art on Terminal World is quite lovely… looking forward to reading the final-final verdict whether or not the inside matches the out. Terminal World is on my “to read” list. I’m looking forward to your review. I love mythology stories too! Maybe that reviewer is known for those kinds of things? who knows. but it was a good laugh. Reynolds is a struggle for me, and I’m not as generous as you, saying that a book you didn’t like made you eager to try another one (paraphrase). I don’t mind the spider cover, but the one on Enterprise of Death freaks me. Ugh. everyone had been telling me how awesome his newer books were, and I do like space opera, so I figured I aughta give him another chance. and the Enterprise of Death? yup, just as freaking disturbing as the cover art. Not for the faint of heart, that’s for sure.